Wimpy Kid Islands open through the weekend only! As my buddy Captain Crawfish blogged a couple weeks ago, April is Diary of a Wimpy Kid Month. So we've been celebrating on Poptropica by opening Wimpy Wonderland and Wimpy Boardwalk to everyone! But alas, Wimpy Kid Month is almost over and so is this promotion. Before the weekend is over, be sure to play the Wimpy Kid Islands. First-time finishers get 300 credits for finishing each island. That's 600 credits total that you can earn. Think of all the cool stuff in the Poptropica Store that you could get! Plus we're giving away a cool Wimpy Kid shirt for your Poptropican, like I'm modeling in the very bright image above. Go play now on Poptropica -- the Wimpy Islands will be members-only again on Monday! Feats of Speed Game #2 is out for a limited time! The latest Feats of Speed racing game is now available to play on Poptropica! Sam's on his treadmill on the Home Island again -- this time wearing maroon. This week's race of agility takes place on Arabian Nights Island. 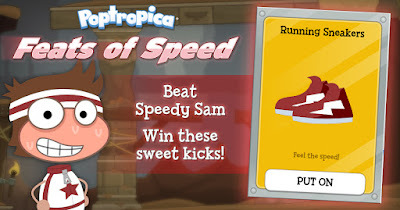 I've heard some Poptropicans say they think it's a little trickier than last week's race, so don't worry if it takes you a few tries to win those maroon sneakers! And if you missed our first Feats of Speed game, no worries -- it's now on the Poptropica app, so be sure to update your devices! Sam's on the Home Island as usual. Beat the world record and get your sweet purple kicks (the first shoes EVER on the app)! Go play on Poptropica or on the Poptropica app now! Another update to the Poptropica app! Another free update to the Poptropica app has raced into the App Store and Google Play. 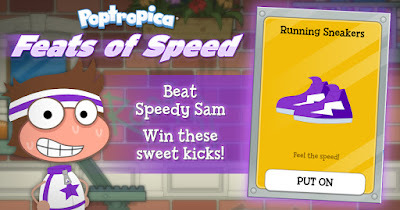 Now, you can race Speedy Sam to the rooftop and win a pair of super-fast sneakers for your Poptropican! Big (no - REALLY BIG) news about Poptropica! Hello everyone! Today is a big day in the world of Poptropica and we’re really excited to share some news with you: Later this year, we are going to be launching an ALL-NEW Poptropica! We’ve been working on this top-secret project for a while and we’re so excited to be able to tell you about it now! So what makes the all-new Poptropica so cool? - New look! The new Poptropica will still be Poptropica, but it’ll be improved. Newer! Shinier! More features, more options, more FUN — on a new app and a new website! - New avatar! We’re exploring new designs, new movements, and new looks for the Poptropican avatar. Don’t worry, the essential elements that make a Poptropican a Poptropican will still be there! But we’ll change things up a bit — in a really good way. - New stuff! Like SHOES! And pets! And so much more! 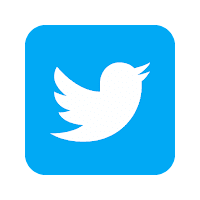 - New social experience! We’re developing a way for Poptropicans to have a fun and safe social experience within Poptropica. It’s going to be awesome. There’s so much more to come, but we’re early in the creation process — and that means this is all we can reveal right now. But as we develop the all-new Poptropica, we’ll give you sneak peeks here on the blog and in the Daily Pop on Poptropica.com. So stay tuned, Poptropicans, and get psyched for the future of Poptropica. It’s going to be simply Poptastic! Howdy, Poptropicans. We have squashed a bug that temporarily disabled the Feats of Speed mini-game. For those who have beaten the race, please return to the Home Island so that you can keep your sneakers forever. We apologize for the inconvenience. Thanks to everyone for participating! 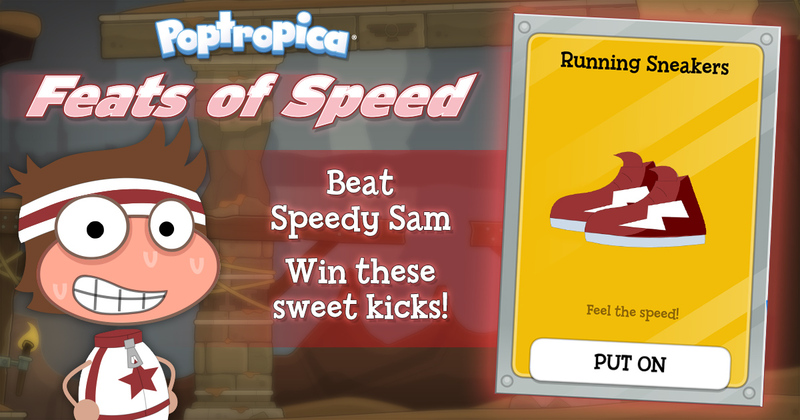 Play our new Feats of Speed game to earn your first pair of sneakers! I hope you're feeling speedy today, Poptropicans, because we've got something awesome for you! Hop on over to the Home Island and look for my friend Speedy Sam, running on a treadmill. He'll challenge you to a race. 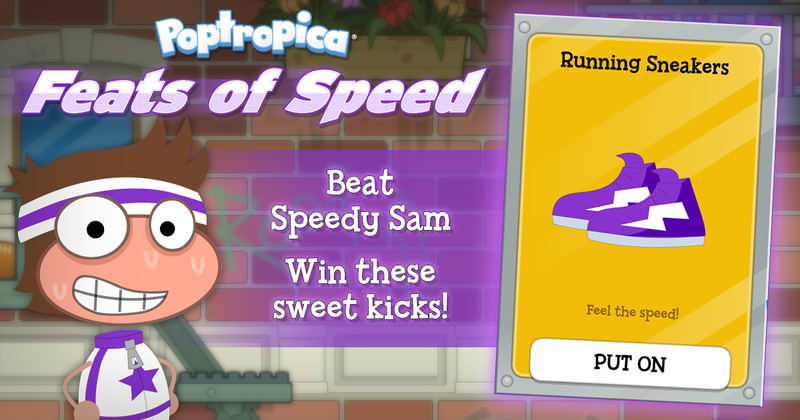 Beat Sam's world record and your Poptropican will get their very first pair of sneakers - ever! Those sneakers will also give you a pretty sweet special power, but you'll have to win them to find out what it is. Yup, we're not just giving away these kicks. You have to earn them. What, you think we're just going to hand over the first sneakers we've ever had in Poptropica? I think not! But don't worry, the race is super fun and I'm sure you'll love it! On your mark, get set, GO race over to Poptropica and play now! We're racing as fast as we can to release a brand-new update that we think you're going to like. We're not just giving away these kicks, though. You've got to earn them! Celebrate Wimpy Kid Month on Poptropica! Hard to believe it, but this month marks 9 years since the first Diary of a Wimpy Kid book hit store shelves. That's a long time, and a lot of laughs! To celebrate Diary of a Wimpy Kid Month, we're opening our two Wimpy Kid Islands -- Wimpy Wonderland and Wimpy Boardwalk -- to everyone! That's right: for the month of April, everyone will be able to play these adventures in their entirety. That's not all. We're also doubling the number of credits that first-time finishers of these islands receive. That's 600 credits in total! One last thing. 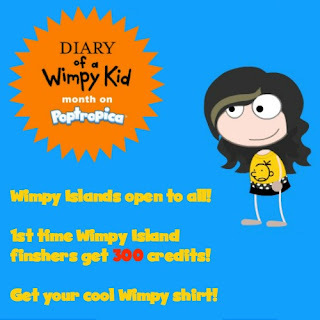 We're also giving away a cool Wimpy Kid shirt for your Poptropican. But it will only be available for a short time! Celebrate Wimpy Kid Month all month long on Poptropica! Check out the all-new FunBrain! Big news from our friends over at FunBrain: they've just launched a newly redesigned site! The all-new FunBrain.com has new games, a new look, and it works just as well on phones and tablets as it does on your computer. A lot of you discovered Poptropica way back when thanks to FunBrain. It's only right that we return the favor. Check out the new and improved FunBrain! Get your free pair of Spring Shoes! Isn't it time you put a spring in your step? All Poptropica players can get a free pair of Spring Shoes for a limited time! To get yours, just visit 24 Carrot Island and click on the cart on Main Street. You'll get your free Spring Shoes. Put them on and press the spacebar to jump super high! This item will only be available for a short time, so go to Poptropica now to get yours! Monkey Wrench Island -- now in Google Play! Users of Android devices, rejoice! The latest update to the Poptropica App has made its way to Google Play. With the latest update, you get a free download of Monkey Wrench Island, plus behind-the-scenes fixes and improvements. It's the best version of the Poptropica app yet! Your March madness winner: Red Dragon Island! Your chance to take a journey to old Japan and save a city on the brink of ruin has arrived! Red Dragon Island is now open to all players, after receiving the most votes in our March Madness competition. We asked players to go to common rooms and vote on the members-only island they most wanted to open. Thank you to everyone who voted. Have fun rocking kimonos, grooming bonsai trees, and wrestling sumos on your way to slaying the sinister Red Dragon and ending the Shogun’s reign of terror! Go to Poptropica now to play Red Dragon Island in its entirety!